HAVERHILL BOROUGH were formed in 2011, making them one of the youngest teams in football. 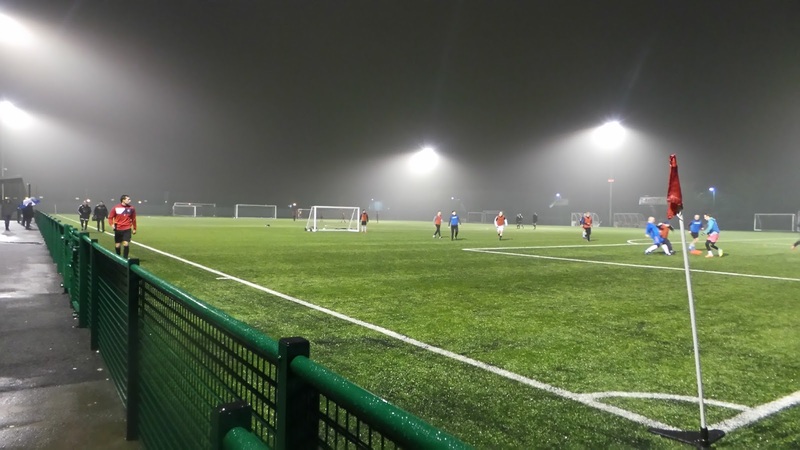 Originally called HAVERHILL SPORTS ASSOCIATION they started out in the Essex & Suffolk Border League. 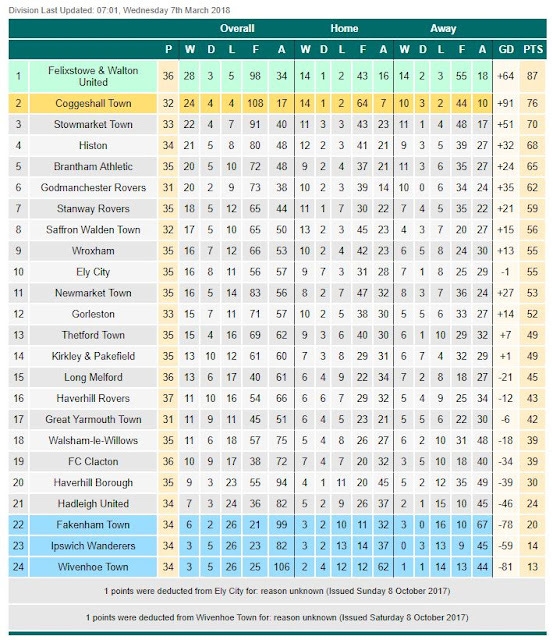 Great success was had here with a double promotion to elevate themselves to the Eastern Counties Division 1 for the 2013/14 season. Following their promotion, they changed their name to its present one and have made a solid start to life at a higher level, with three top-half finishes in their first three seasons. 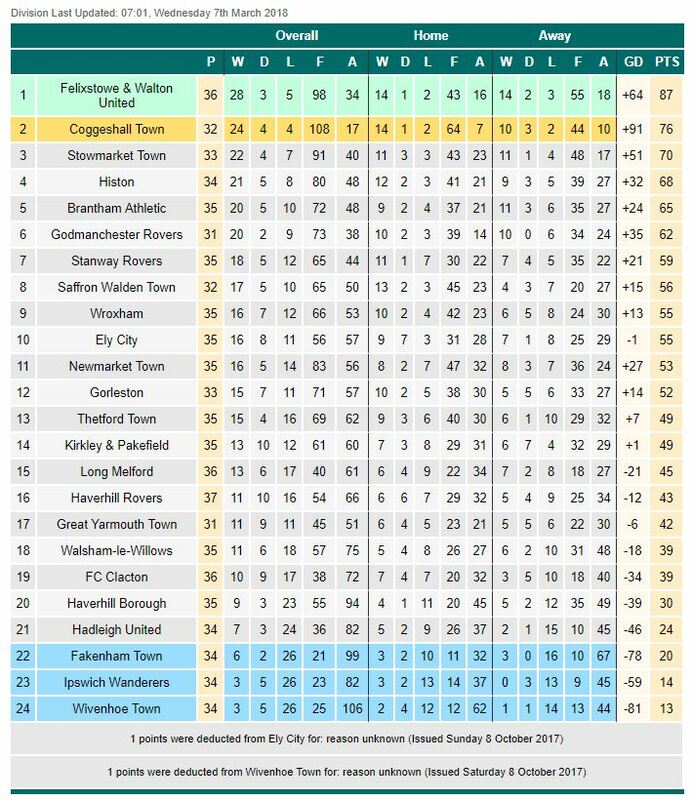 Last season they did even better, a 3rd place finish behind Stowmarket Town & Coggeshall Town was good enough for promotion to the Premier Divison. Their start to the season has been unspectacular, but no doubt survival is the aim in the first season. They look set to achieve this at present, sitting ten points ahead of the drop zone at the time of the game. In the FA Cup, their debut season of 2014/15 has seen their best progress so far. Barking and Whitton United were defeated before a 1st Qualifying Round defeat to Leiston. 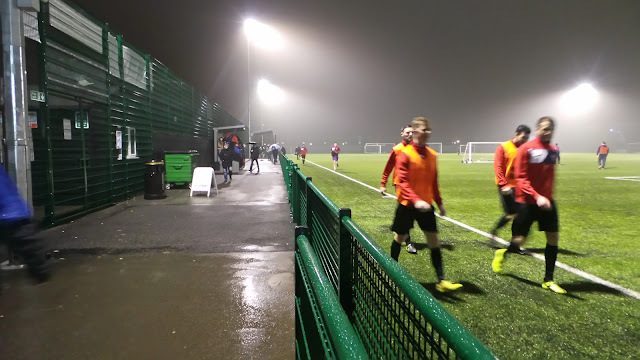 They did match that progress this season, only to lose 8-0 to Kings Langley. In the FA Vase, the 1st Round has been reached twice - losing in 2014 to AFC Dunstable and in 2017 to Felixstowe & Walton. 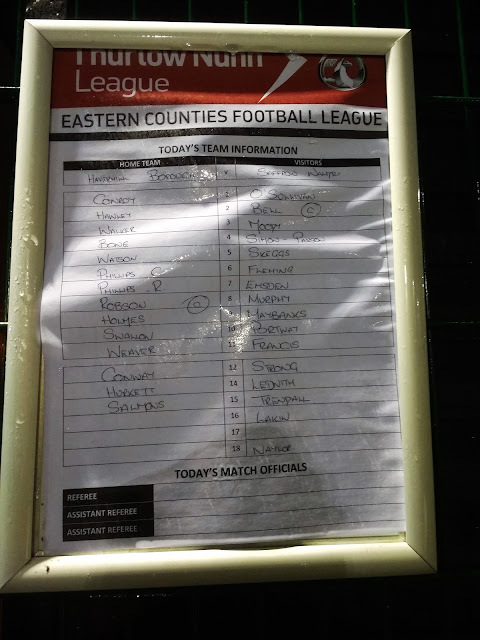 Haverhill Borough won the Eastern Counties League Knockout Cup in 2016 with a convincing 5-0 win over Stowmarket Town. After sharing with neighbours Haverhill Rovers for the first 6 years of their history, they got their own 3G pitch this season and now play the vast majority of the games here, with it being adjacent to Rovers' home. 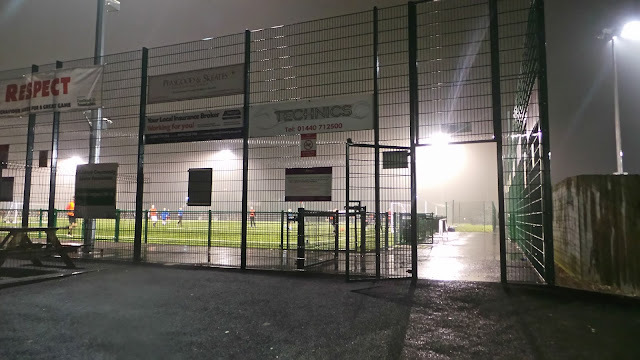 I always like a bit of Friday night football, although bad weather meant that it had been a few weeks since I had kicked off the weekend with a game, rather than staying in. There were not a huge range of options this week, with just Haverhill Borough v Saffron Walden Town as an option. With the weather being horrendous last weekend, I'd actually tried to visit last Saturday, but even 3G couldn't save the day under deep snow. 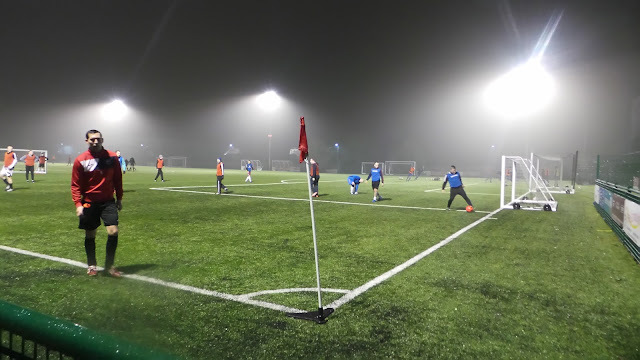 Thankfully, it had long since disappeared and there appeared to be no problem with the game going ahead. It was hardly the most inspiring of venues, right next door to the venue I'd seen the Haverhill derby at a couple of years previously. 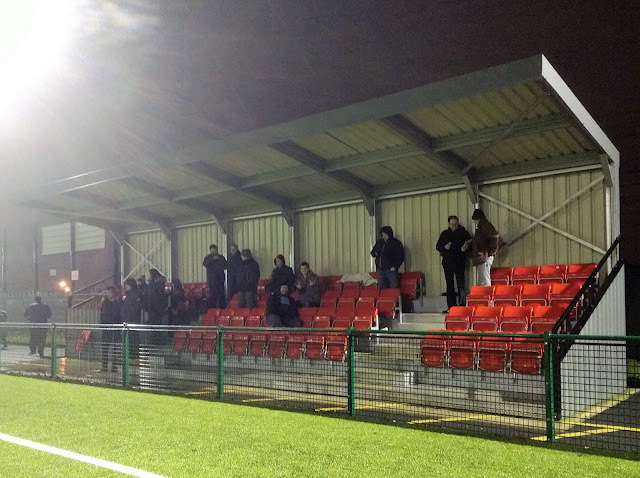 It was also similar in terms of ground, just a couple of metal stands put down to comply with ground grading. They all had to be ticked however and I would have company in Josh, who lived nearby in Finchingfield. Sadly, it was impractical to pick up the other Braintree fans I know, as travelling to them could add up to an hour on my journey, what with the rush-hour traffic. I was glad when fellow hopper Anwar agreed to come with me, as it would help out with costs and keep me company. 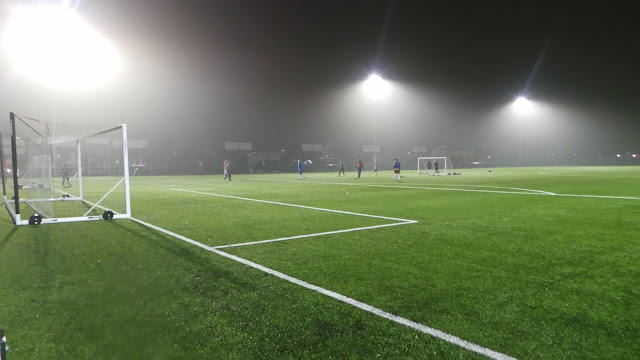 The night before was spent trying to plan football my week off, which was easier said than done. If the weather wasn't looking dodgy then there was a lack of decent pubs or the hotels were not there or too expensive. I decided to leave it in the end and look nearer the time. The day of the game came and it was a fairly easy day at work and it was a fairly easy one, with me finishing at 12. I got some shopping and went home for the afternoon, having lunch, a shower and lazing around until it was time to leave just after 4. 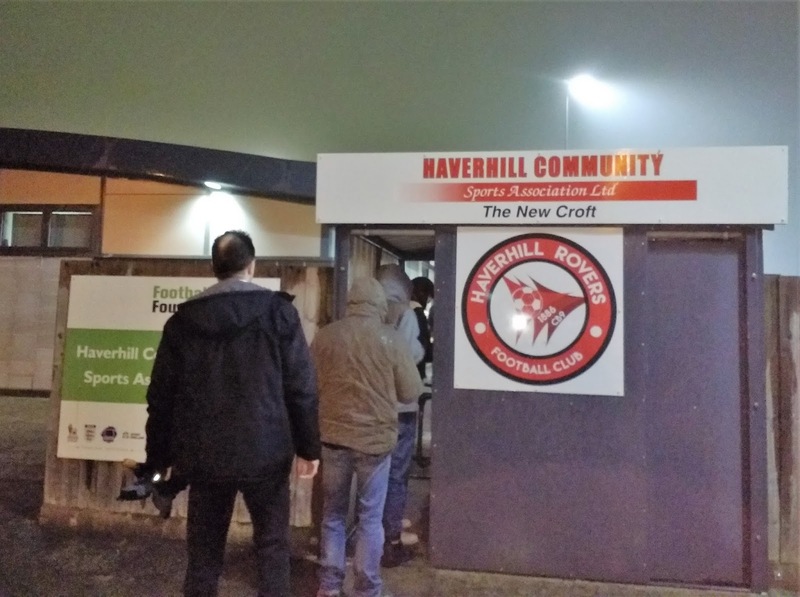 There didn't seem to be a great deal of enthusiasm on the Haverhill Borough Twitter, with no posts since February, but the 'New Croft' and Saffron Walden's Twitter both confirmed the game was on. The only question was, what game would I be seeing? 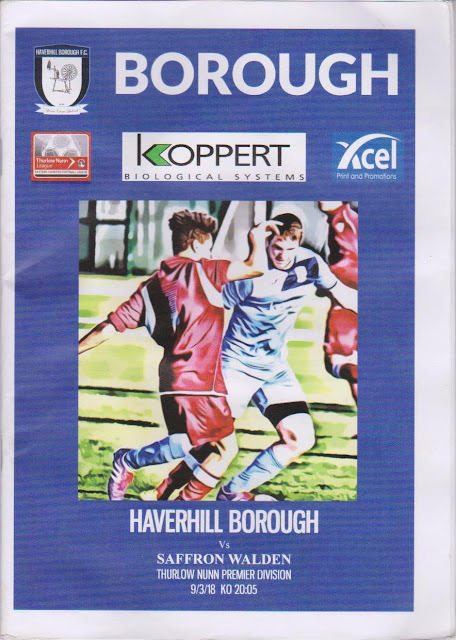 Both of Haverhill Borough's teams were playing at the same time, with the reserves also in action at the same time. I'd be wanting to see whatever game was on the 3G pitch but was hoping it would be the first team game. I got to Anwar at 4.40 and soon enough we were on our way. My Sat Nav indicated plenty of delays, with half an hour added to the journey, but that was par for the course on a Friday evening. The main culprit, of course, was the M25, adding an hour to my journey. I got to Finchingfield at 7, but my timing was impeccable, as Josh, who had also been delayed thanks to the laughable road system in Braintree, arrived just as I pulled up. We headed to Haverhill and as we all needed dinner and Anwar needed cash, we pulled over in a car park. Josh went off to KFC whilst myself and Anwar went to Aldi. I picked up some good bargains with some nice chicken for dinner, plus some crisps and new ciders for later. Soon enough, we all met up and drove the final 5 minutes to the ground. The car park was pretty busy with two games on, but there was still plenty of space. I went to the turnstile, paying £6 to get in, plus £1 for what was a decent programme for the price. 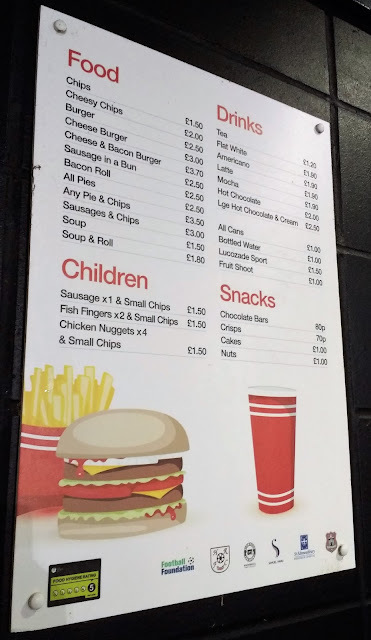 I also, later on, got some chips, which were pretty good too. The game started with the hosts well on top and in the opening exchanges they had a shot cleared off the line and hit a post. Despite Haverhill having the better of the first half, it was Saffron Walden that took the lead on 37 minutes. It was some neat footwork and a tidy finish in the bottom right-hand corner of the net by Lewis Francis but the scoreline didn't reflect the balance of play. It was only thanks to a good double save by visiting keeper Neil O'Sullivan the kept the scores level at the break. I met 'Lesta Blue Hopper' during the halftime period, he'd come here after his game at Clacton had been called off. Soon though, it was back to the on-field action. The second half started in much the same vein and Borough hit the bar with a rising shot early on in the half. The pressure continues and O'Sullivan made another great save to tip the ball over the bar. The resistance was not going to last though and from the resulting corner, the ball was cleared. It fell to Rory Lee, who smashed home a terrific deflected equaliser on 78 minutes. There was then a dubious free kick awarded to Saffron Walden after the Haverhill man appeared to win the ball. 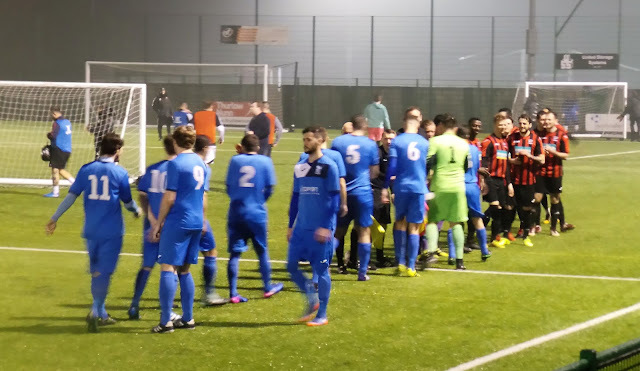 A free kick was awarded just outside the area but the resulting effort was more akin to something on a rugby pitch with the ball going well over the bar. Another good save from O'Sullivan looked to have saved Saffron Walden Town a point, but Haverhill Borough were not to be denied. Cameron Watson headed home from a Ryan Swallow corner to seal a deserved victory for the hosts. The Haverhill Borough equaliser from Rory Lee, cracking goal. The game went on for a bit, and it was 10:05 by the time the final whistle was blown. 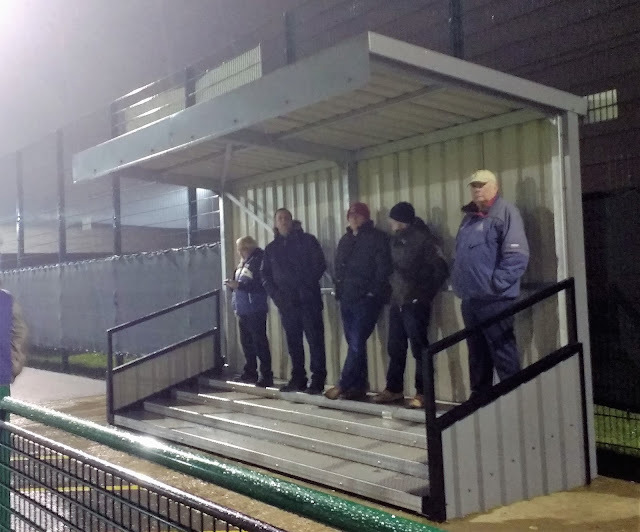 A decent crowd of 102 had seen an entertaining contest which had been just reward for braving a filthy night. It was a few minutes walk back to the car, where I got a can of Irn Bru to drink on the way back. It was back on the windy roads to drop Josh off at 10:30. There was still some more to endure before we got back on the main roads but at least I had the Two Mikes on TalkSPORT to keep me company. It made the journey pass a lot quicker and before I knew it, I was dropping Anwar off at midnight. 20 minutes later, I was back home myself and after saying hello to my Dad, I poured myself a cider and listened to the rest of the Two Mikes. After that, it was catching up with my YouTube subs, while I worked on tonight's blog. THE NEW CROFT 3G is hardly the most inspiring venue to watch a game with only half the pitch being available to spectators. There's a covered seating and standing area and these did their job on my visit. Flat standing is also available. The tea bar is shared with the main stadium and this is pretty decent. I didn't check out the bar, but there's a good Wetherspoons, 15 minutes away in town, which also has a number of decent takeaways and shops.